Not great choices, but I think most people would opt for the third scenario. This represents death by the chemical insecticide Pyrethroid. The first two scenarios would be your fate if you were the victim of organic pest-control methods: introducing the Ichneumon wasp as a natural insect predator or “flaming,” where intense heat burns off the insect’s antennae and legs. But, as an insect in this scenario, should you really be worrying about pain anyway? The Aleiodes indiscretus wasp laying eggs in a gypsy moth caterpillar. Almost every pest insect species has at least one wasp species that preys upon or parasitizes it. Do insects consciously experience pain? There’s actually a good deal of scientific research that suggests, yes, you should be worried. We know that many insects are capable of relatively complex cognition. Even cockroaches, whom most of us would squash without hesitation, demonstrate place learning, the process of linking experiences with the locations of occurrence. An Epilachninae beetle. 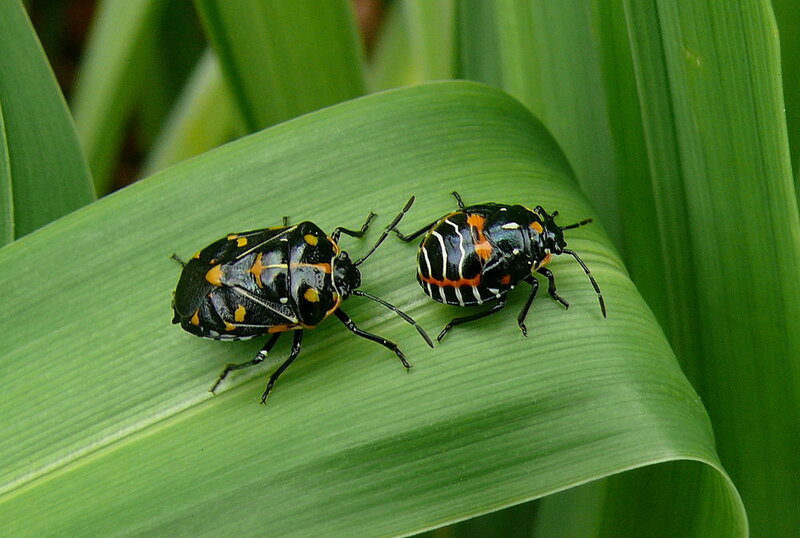 These crop pests can cause locally severe crop losses. The Epilachninae are hosts to parasitoid wasps, so can be managed using biological methods. But aren’t insect lives pretty terrible anyway? Insects suffer horribly in the wild; they live short lives that, more often than not, end in brutal death by predation or starvation. In this sense, using insecticides to kill bugs might actually do good by preventing the existence and painful death of lots more miserable insects. Even when insecticide-sprayed fields have lower populations of non-pest bugs, this means less insect suffering as well, as fewer bugs are injured during harvesting. This is an argument against using no-kill pest control techniques that reduce future populations without insecticides. For instance, Sterile Insect Technique (SIT) involves the release of sterile males to reduce subsequent populations. Similarly, behaviour modification techniques like mating disruption use synthetic pheromones to tempt males away from real-life females. Obviously these methods remove the risk of chemical contamination of soil, rivers and streams, and the resulting suffering of resident vertebrates as well as the potential negative impacts on human health. However, as they only target one pest at a time, these methods are more expensive and don’t reduce insect populations across the board in the same way that broad-spectrum chemical insecticides do. At this point, it’s important to recognize some other ways that pesticides reduce suffering in our world. If we stop using the most effective insecticides and allow more crops to be destroyed, livestock and humans suffer. Herbivorous insects are said to be responsible for destroying one fifth of the world's total crop production annually, and this has repercussions for the lives of those that feed on these crops. (Obviously, telling farmers that they must accept this loss because insects might be sentient isn’t going to fly.) Insecticide use can also make farming more efficient, and by using less land, farmers reduce habitat destruction associated with the suffering of other wild animals. With this in mind, let’s turn our attention to which pest control methods generate the least amount of suffering for insects. What are the most humane methods of pest control? Currently the most commonly used chemical insecticides are carbamates and organophosphates (OPs), which work by poisoning the nervous system, causing rapid twitching of voluntary muscles and then paralysis. Overexposure to OPs and carbamates in humans causes headaches, muscle twitching, difficulty breathing, or swallowing and sweating, which may be an indication of the sort of suffering the insects experience. OPs can also cause brain damage in children, and for this reason, Chlorpyrifos will soon be banned in the US. Additionally, recent research suggests marine mammals may be slowly accumulating the pesticides in their bodies. Another option, Insect Growth Regulators (IGRs), interfere with an insect’s development by preventing the natural skin-shedding process from occurring, or stopping the formation of new skin at the right time. This typically leads to either rupture of malformed cuticle or death by starvation – not a pleasant end in either instance. It seems like a no-brainer that if we are to kill insects, we should do it as humanely as possible. Fortunately, there are more humane insecticides than the most common options detailed above. For example, pyrethroids are harmless to humans and extremely fast-acting in insects, causing almost immediate paralysis. These are still used in the majority of commercial household insecticides, but are no longer featured in the agricultural market sector, perhaps because other pesticides are more efficient in the fields. 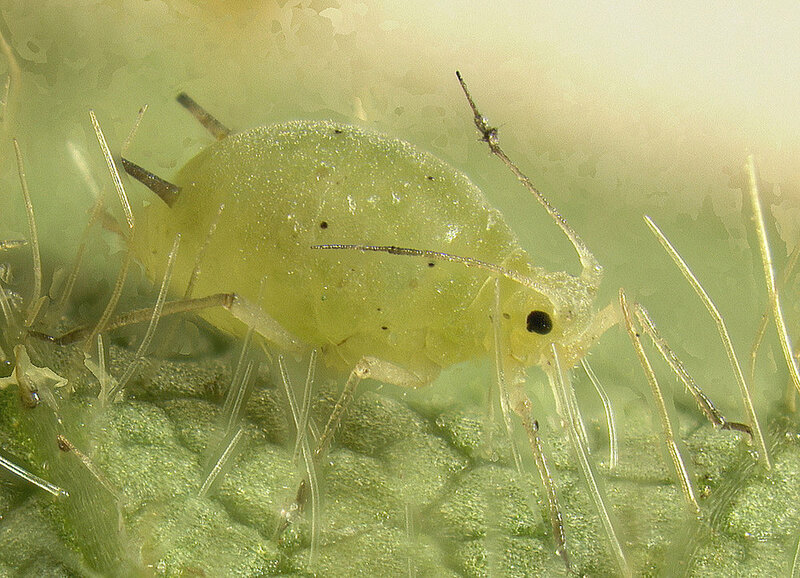 A soybean aphid: soybean producers can choose from a variety of insecticides from the carbamate, pyrethroid, and organophosphate chemical families to control these insects. Organic methods of biological control, where insects are killed by predators, parasites or pathogens, can lead to a swift death but, as we saw with the wasp parasite, not always. Bacillus thuringiensis (Bt) insecticides or larvicides kill insects using bacterial toxins, paralyzing the gut and rupturing cells in the stomach lining of the insect. This may cause immense suffering over several days before death. Entomologist Jeff Lockwood believes the most humane method of pest control is “cultural,” preventing insects from occupying the crops in the first place using crop rotation or sanitation. Like repellents, SIT and behaviour modification, these methods naturally reduce specific insect populations without pain. However, they are expensive to implement, time consuming, and often less effective. Persis Eskander, Executive Director of Wild-Animal Suffering Research, advocates for an approach that partners the most humane broad-spectrum insecticides with behaviour modification techniques. Transitioning to more humane pest control methods is likely to increase costs dramatically. Ethicist Brian Tomasik has evaluated the cost-effectiveness of paying farmers to use faster-acting pesticides. Tomasik calculates that each dollar used for this purpose would prevent the equivalent of 250,000 “experiences of being killed” by a more painful chemical. He considers that if death by pesticides is as bad as spending two days in a factory farm, this is like preventing 1,369 years of suffering for factory-farmed animals per dollar. Jeff Jordan points out that such subsidies would require minimal bureaucratic support and a low burden of proof; administrators would simply need to check that the subsidized pesticides are actually being used. A few people could help a far greater number of animals than most other charities, with much less ambiguity as to whether their efforts had the intended effect. Subsidies could also provide more opportunities to measure the effects of different pesticides and better understand what the most humane method really is. Another approach would be to fund research or advocate policy changes that require all farmers to switch to more humane pesticides. A European study investigating the impact of neonicotinoid pesticides on bees living nearby. Klein, C. & Barron, A. B. 2016. Insects have the capacity for subjective experience. Animal Sentience. 2016, 100. Eisemann C. H. Jorgensen W. K. Merritt D. J. Rice M. J. Cribb B. W. Webb P. D. Zalucki M. P. 1984. Do insects feel pain? A biological view. Experientia 40:164-167. Smith, J. A. 1991. A question of pain in invertebrates. ILAR Journal, 33, 25-31. Healy, K., McNally, L., Ruxton, G. D., Cooper, N. & Jackson, A. L. 2013. Metabolic rate and body size are linked with perception of temporal information. Animal Behaviour, 86, 685-696. Rollin, B. E. 1989. The Unheeded Cry: Animal Consciousness, Animal Pain and Science, Oxford University Press, p.143. Meyer, W. K., et al. 2018. Ancient convergent losses of Paraoxonase 1 yield potential risks for modern marine mammals. Science, 361, 591-594. Lockwood, J. A. 1987. The moral standing of insects and the ethics of extinction. Florida Entomologist, 70-89. Eskander, P. 2017. An Analysis of Lethal Methods of Wild Animal Population Control: Invertebrates, Wild-Animal Suffering Research. Jordan, J. 2015. Humane Pesticides as the Most Marginally Effective Cause, Effective Altruism Forum.